I remember the day I wrote this haiku that it felt like the beginning of fall. The cool crisp air and smells of autumn wafting in the air. 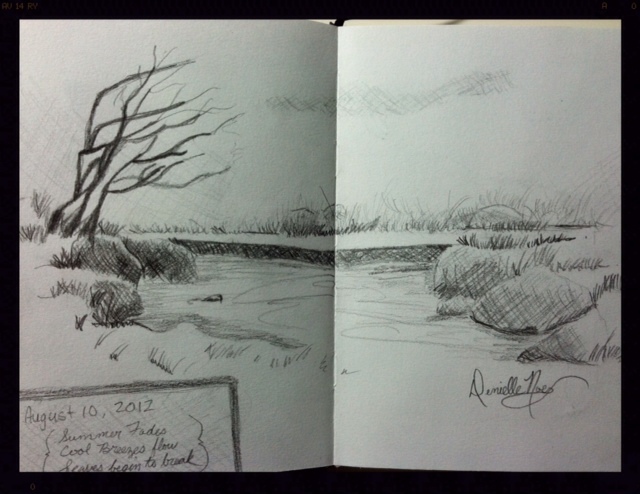 At the time, I was inspired to draw this scene from a quick tutorial offered on Derwent’s website. At the time I needed to start getting into the groove of drawing and the tutorial was exactly what I needed to inspire me to draw. Sometimes you just need to not to have to think about what you are going to draw and just simply be guided by a book or website. It’s a wonderful way to unwind and just let go. Next Post My niece’s first Zentangle tile! I’m so proud!